I was reading a thread on Serious Eats about how the poster was feeling uninspired in the kitchen since going vegetarian. In many ways, I sympathize. All the more so because I’m not vegetarian (or pescatarian, as the case is in our household) but economics and convenience tend to force my hand into cooking that way most of the time. And most of the time, I truly don’t mind. I eat meat when we eat out (it might contribute to my beef tartar obsession at The Greenhouse Tavern when my dad generously treats me to lunch there every couple of weeks¹), or cook a small serving for myself while Zak fends for himself (duck wings are popular for that). But sometimes, I just can’t think of anything interesting. What we end up with might be good, but it’s a good variation on what we’ve made a thousand times, or not-quite-good-enough to share. That lethargy is compounded once I head back to school and don’t get out of class until late, so dinner either has to be quick or pre-made (or made by my awesome husband, who does his fair share of the cooking). This, though … this is interesting. This started with the idea of a simple sweet potato taco, evolved into a sweet potato and black bean taco or burrito, and then in a stroke of madness (genius) morphed into this dish – a cheesy, spicy, sweet, and creamy sweet potato and black bean enchilada. The enchilada sauce is made from charred green peppers and jalapeños which in one fell swoop uses up my copious green peppers and adds a hint of bitterness and an big punch of spice that tempers the sweetness of the honey-glazed sweet potatoes. The flavors work really well together, with the sweetness of the potatoes balanced out perfectly with the heat of the pepper sauce, jalapeños, and creamy cheddar and beans. This was really good both with and without the bacon. 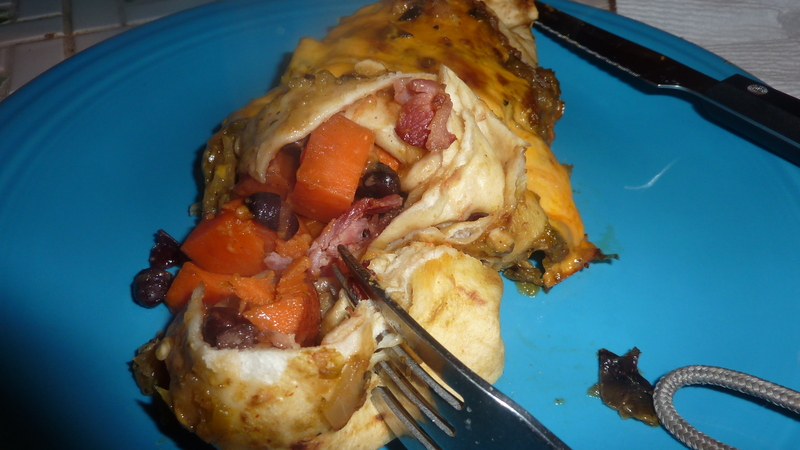 It added a salty, meaty bite but was totally not necessary to the overall effect of the enchilada – in fact, I added it as an afterthought. I mean, let’s face it, bacon makes almost anything better and this was no exception. At the same time, it was truly amazing how complex and interesting the flavors were without it. This really reminded me how fun, interesting, and inspirational vegetarian cooking really can be. If using, cook bacon for 5-7 minutes in a microwave on paper towels until crispy. Cool, and roughly chop. Set aside. Toss sweet potato cubes with olive oil and season with ancho chile powder, salt, and pepper. Spread on a tinfoil lined baking sheet and roast 15-20 minutes until easily pierced with a fork but not falling apart. Remove from oven and set aside. In a medium sauté pan, add water and heat over medium-low heat until steam begins to rise. Drizzle in honey, whisking continuously. Once smooth and incorporated, add pepper sauce. Add sweet potatoes and toss to coat. Cook, raising heat to medium-high and stirring frequently, for 5-7 minutes until a sticky glaze forms on the sweet potatoes. Add beans and 1/2 cup of cheese and stir to combine. If using, add bacon. Spray a 9″ x 13″ casserole with nonstick cooking spray. Spoon about 1/4 cup of green pepper enchilada sauce (see below) on the bottom of the pan. Take a flour tortilla and, using a pair of tongs, dip it in the green pepper enchilada sauce on both sides to lightly coat. Place in the casserole dish. Add about 1/2 cup filling to the center. Carefully roll into a tube shape, careful not to burn yourself. Position so the seam side is down. Repeat with remaining tortillas and filling. 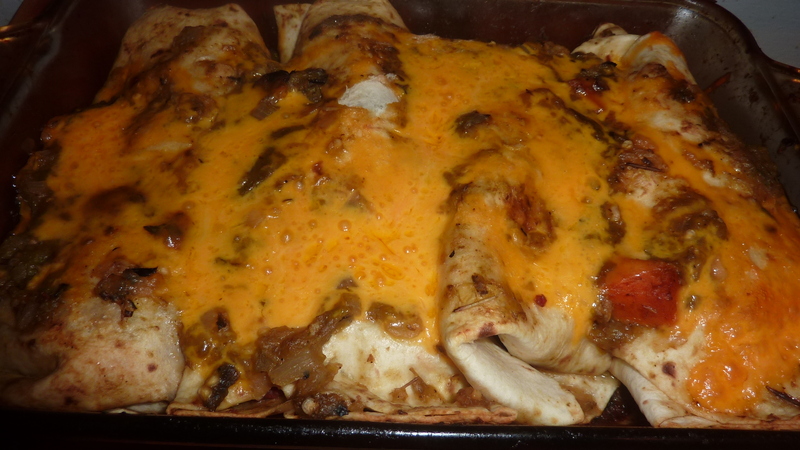 Pour any remaining enchilada sauce over the top of the enchiladas. Top with remaining 1/2 cup of shredded cheddar cheese. Cover with tinfoil. Transfer to oven. Bake 25-30 minutes, removing tinfoil for last ten minutes, until cheese is bubbling and golden brown. Serve immediately. Coat peppers in olive oil and place under the broiler and broil 3-4 minutes per side, turning frequently, until outside is blistered and flesh is tender, for a total of about 20 minutes. Transfer to a ziplock bag. Let cool. When cool, remove charred outer skins from the peppers and discard. Remove stems, seeds, and inner membranes. Dice flesh. Heat canola oil in a Dutch oven over medium heat. Add onion and sauté until translucent, 5-7 minutes. Add garlic and sauté 1-2 minutes until fragrant. Add diced pepper flesh and stir to combine. Add water, ancho chile powder, salt, and pepper. Simmer for 10-15 minutes to incorporate flavors. Using an immersion blender or transferring to a blender, puree until smooth. Set aside. When we received three different types of peppers in this week’s CSA share, my mind immediately jumped to Chipotle’s fajitas (I had been bemoaning the lack of a Chipotle near school the day before). I decided to make a burrito bowl with rice, creamy pinto beans, sautéed peppers and onions, and cold esquites as a corn salsa. I was particularly excited to make this due to the fact that we had received a variety of salts, pepper flakes, and hot sauces as one of our wedding gifts from our friend Diane. Though I love to cook from scratch, sometimes it is super helpful to use some flavor enhancing shortcuts. Here, the bacon salt (which was artificially flavored) meant I could make the beans flavored with the smokey, meaty flavor of bacon without actually using bacon – which means Zak could happily eat them. The jalapeño pepper sauce imparted spicy jalapeño flavor without the need for chopping and deseeding. I can’t wait to use more of the awesome products she gifted us, especially some of the fancier salts that I would usually not justify purchasing on my own. Combined together, the separate components of this dish were excellent. Spicy and sweet, hot and cool, creamy and crunchy. It was filling from the rice as beans but not overwhelmingly heavy thanks to the fact that it was heavy on vegetables, including the corn, peppers, and onions. 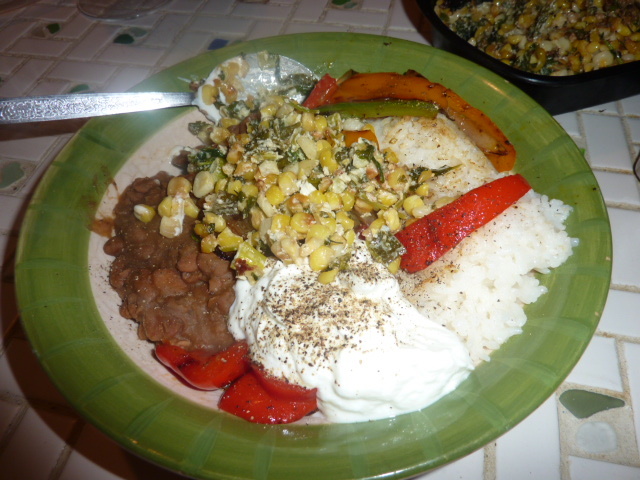 This also reheated really well (I packed the esquites separately and everything else together). While it wasn’t a dead on knock-off of Chipotle, or anything, it was pretty darn good. Pick through beans to make sure there are no stones or deformities. Place in a pot and cover by 2″ with cold water. Let soak overnight, or at least 8-10 hours. In this recipe, I substituted the jalapeño with 1 tsp. Arizona Gunslinger Green Jalapeño Pepper Sauce. Additionally, I doubled the cilantro and used both the whites and greens of the scallions. I used garlic salt rather than garlic (because I had forgotten to chop it when I was adding the ingredients at the end), and chipotle pepper flakes rather than crushed red pepper flakes. The original recipe, of course, would be fine as is. In a grill pan or cast iron skillet, heat canola oil over medium-high heat. Add onions and peppers and cook, stirring frequently, until charred and soft. Season with pepper flakes, salt, and freshly cracked black pepper. Starting with rice, then beans, then fajitas, then corn (or however you like it!) layer ingredients in desired amounts. I was in the mood for a hearty dish with a lot of flavor, but I was emphatically not in the mood to do a whole lot of dishes. So I conceptualized a baked cheesy rice and beans dish that could be made in one pan. The key here, of course, is to use an oven proof pan, preferably cast iron because it will create a nice crust along the sides and bottom of the rice. This dish has a dirty rice kind of feel to it, but the flavors are really unique thanks to The Czar’s Pinot Szechuan sauce and the green chilies. 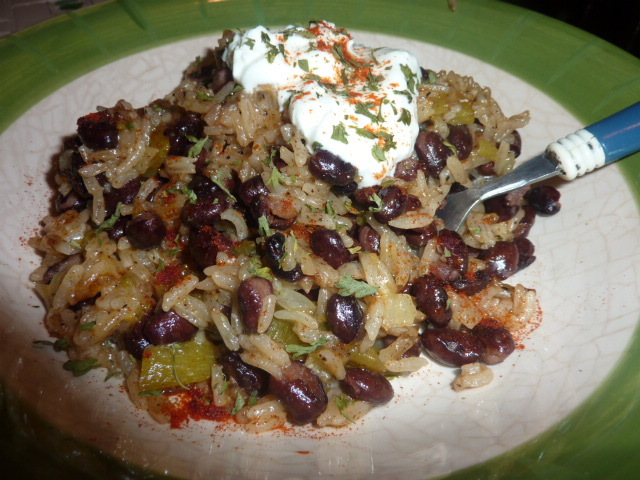 Every bite has a nice mix of flavors and textures, from slight heat of the green chiles and pinot szechuan sauce to the cool plain Greek yogurt, the creamy beans and cheese and crunchy rice … it makes this dish interesting and addictive. It also heats up super well as leftovers and drew several comments about how great it smelled in the kitchen at work. It also works really well as either a side dish or a main course, and can be made vegetarian by substituting vegetable stock for chicken stock. Heat olive oil in a 10″ cast iron pan set over medium heat. Add rice and cook, stirring, until rice turns opaque. Add onions and cook until fragrant, roughly 1 minute. Add onion and cook until transparent, stirring frequently, about 2-3 minutes. Add green chilies and stir to combine. Slowly whisk in stock and bring to a boil over high heat. Season with salt and pepper. Reduce heat to low and simmer, covered, for 15 minutes. Remove from heat. There should be about 1/4 cup liquid remaining in the pan at this point. Add the beans and cheese and toss to combine. Place in oven and bake uncovered for 20 minutes until rice is tender. Serve immediately topped with sour cream or plain Greek yogurt and some paprika. 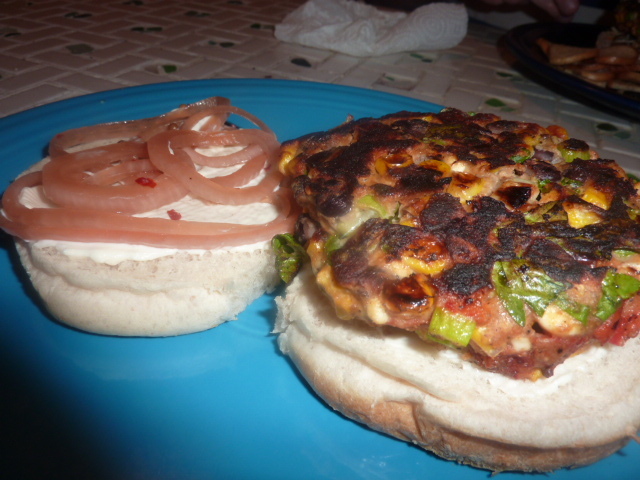 This veggie burger was quite the success. In part, I think, because I didn’t try too hard to imitate a regular beef-patty burger. Rather, it’s a mix between a traditional veggie burger patty and a fritter, modeled off of the roasted red pepper and feta fritters that were one of Zak’s favorite items from the first year of the blog. This burger was a far cry from some of the very “one note” veggie burgers I’ve tried. Instead, each bite is packed with smokey roasted red peppers, salty feta, sweet corn, rich black beans, sharp scallions, and bright, fresh parsley. The awesome pickled red onions (seriously, they are going to be a constantly-in-the-fridge staple from now on in our house) made it feel extra special, while the light smear (or healthy dollop, your choice!) of mayo kept the whole thing together perfectly. The patty stayed together well thanks to an egg and a sprinkling of whole wheat flour, neither of which detracted from the fresh taste of all the vegetables. Just be careful not to add too much flour, or this will end up tasting too much of flour and not enough of veg. It wouldn’t be the worst thing in the world, but you’re already getting a lot of dough-y flavor from the hamburger bun and even more could easily drown out all of the vegetable flavor. Cover a baking sheet with tinfoil and spray with non-stick cooking spray. Place red pepper halves on baking sheet and spray with non-stick cooking spray. Place in broiler and broil 20 minutes, flipping halfway through, until flesh of peppers is blacked and charred. Transfer immediately to a zip lock bag and zip closed. Let sit until cool enough to handle, about 20 minutes. Remove the skins from the peppers – they should easily slide off at this point. Roughly chop the roasted red peppers. If there is a lot of liquid in the peppers, drain through a colander. In a medium bowl, mix together chopped roasted red peppers, corn, black beans, parsley, garlic, feta, kosher salt and freshly cracked black pepper. Mix together thoroughly. Slowly mix in flour until the fritters will hold together. Heat oil in a 10″ cast iron skillet over medium high heat. Spoon about 1/3 cup of fritter mixture, formed into patties, into the pan and cook 3-5 minutes per side until firm in the middle and slightly charred on the outside. Serve as directed below. Spread both halves of the hamburger bun with mayo. Add roasted red pepper and black bean patty (see above). Top with pickled red onions. Serve immediately. While rooting around in my crisper drawers, I found some dill hanging on to dear life and knew I needed to use it immediately. So, rooting around the pantry, I settled on beans with some mustard and dill. Zak wanted tomatoes, and I was happy to accommodate him. This simple dish is very flavorful and satisfying. The punch of garlic and dill plays really well with the tangy dijon mustard, sweet honey, and acid of the tomatoes. The beans were extremely creamy due to the frequent stirring. I’m always pleasantly surprised when a dish that is extremely healthy is also extremely flavorful – a true testament to the fact that you don’t need to add butter, cheese (at least, not much of it), meat, or bad-for-you oils and fats to create a dish that is filling and tasty. 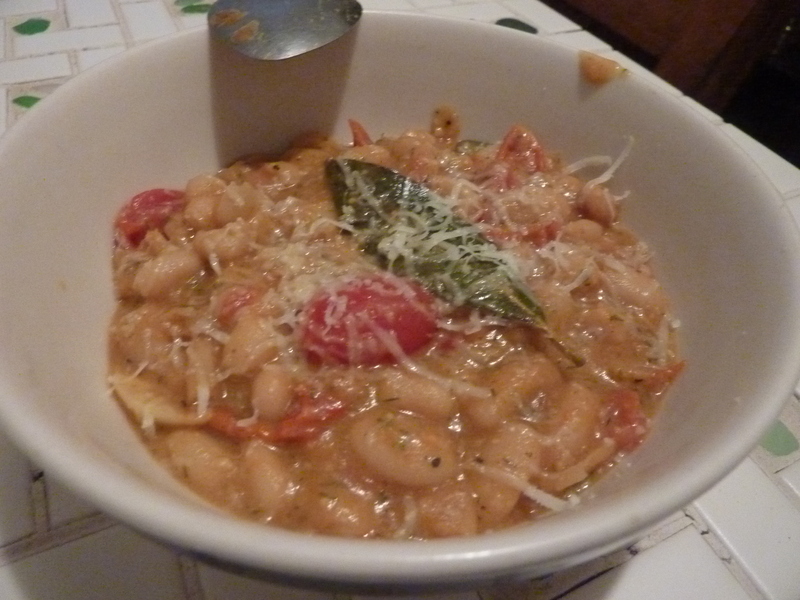 In a large sauté pan or cast iron pan, add cannellini beans, tomatoes, bay leaves, and 3-4 of the cloves of garlic. Add two cups of water so the beans and tomatoes are mostly submerged. Season with freshly cracked black pepper. Turn on heat to very low. Add remaining garlic cloves and dill to a food processor. Pulse a few times until garlic cloves are finely chopped. Add lemon juice, mustard, and honey. With food processor running, slowly add olive oil until emulsified. Taste for seasonings and add kosher salt and black pepper as desired. Continue simmering beans and tomatoes. A few bubbles should break the surface of the water every minute. Stir frequently, cooking for 30-45 minutes until most of the water is evaporated. Raise heat to high and cook, stirring continuously, until almost all moisture is evaporated. Remove whole garlic cloves and bay leaves. Toss with dressing. Top with Parmesan cheese, if desired.